The Chicago Blackhawks are Stanley Cup champions once again after defeating the Boston Bruins in epic fashion last night, 3-2 to close out the series in six games. The Blackhawks scored two goals in 17 seconds at the end of the third period to take home the title, after trailing 2-1 with just seventy-six seconds left to play and the game seemingly destined for a Game 7 matchup back in Chicago. But Bryan Bickell and Dave Bolland made sure that wouldn’t happen, and with the epic comeback the Chicago Blackhawks hoisted Lord Stanley’s cup for the second time in four years. Patrick Kane won the Conn Smythe Trophy as NHL playoff MVP. 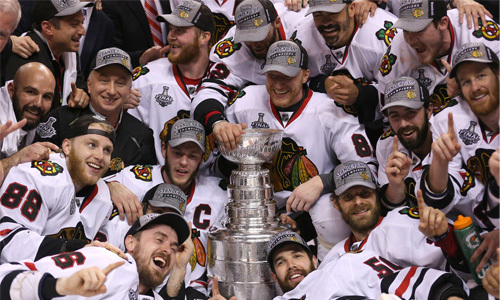 This is the Blackhawks’ fifth Stanley Cup title in franchise history.